NASA has released a request for proposals for a contract to procure commercial space launch services from U.S.-based companies, Nextgov reported Wednesday. 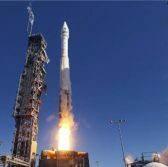 A FedBizOpps notice posted Monday says the NASA Launch Services II contract has an “on-ramp” provision that allows the agency to seek proposals from new launch services firms and current contractors with new technology at least once a year. “Industry response to the RFP synopsis released in early June 2018 revealed enough interest to warrant issuance of the 2018 on-ramp solicitation,” Jim Norman, director of launch services at NASA headquarters, told Nextgov. The agency wants proposals from launch services providers with vehicles certified at risk categories 2 and 3 and have the capability to bring a 250 kilogram-payload to orbit at an a launch inclination of 28.5 degrees and altitude of approximately 200 kilometers. Potential offerors can submit questions related to the NLS II contract through Sept. 11 and have until Nov. 29 to submit proposals, according to the solicitation’s cover letter.